Meydan today announced that internationally renowned artiste Sting will perform 'live' at the Dubai International Racing Carnival's Super Thursday on March 4. A composer, singer, actor and activist, Sting has evolved into one of the world's most distinctive and highly respected performers, collecting as a solo performer 11 Grammys, 2 Brits, a Golden Globe, an Emmy, three Oscar nominations, Billboard Magazine's Century Award, and MusiCares 2004 Person of the Year. 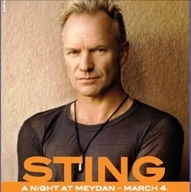 Speaking of the upcoming performance by Sting, Mohammad A.Nasser Al Khayat, Commercial Director of Meydan said: "Sting is not only one of the best in his field, a perennial performer who has seen not only international success but also longevity in his career span. He appeals to both young and old and is a true citizen of the world who cares about the people and the environment around him. Sting represents many of the values Meydan upholds for itself, as we hope to set the same benchmarks when it comes to international racing, the same way Sting has achieved worldwide acclaim over the course of his career." Frank Gabriel Jr, CEO of the Dubai Racing Club added: "Sting is an excellent addition to our Super Thursday programme as his music transcends all. It is important to us that performances at the Dubai International Racing Carnival are appreciated by general audiences, as our race meetings see participants from various geographies, and Sting's music is a universal example of how it can bring people together regardless of nationality or language. The concert is the perfect complement to end an exciting evening at the races." Sting is booked by Live Nation, the largest producer of all live concerts in the world. Producing over 22,000 concerts annually for 1,600 artists in 33 countries, they will be working together with award-winning event company M-is from the United Kingdom, to deliver a stunning and unforgettable night with Sting at Super Thursday at Meydan. The concert is in conjunction with Dubai International Racing Carnival's Super Thursday racemeeting and is expected to commence after the last race at 11 pm. Gates to Meydan will open from 6 pm for ticket holders who are interested to also view the races. Ticket prices start from 150 AED for free standing admissions, and 735 AED for premium seats. Download the concert seating plan from this link. Tickets are on sale now from Virgin, Box Office and Time Out. For Virgin, please visit www.ticketingboxoffice.com. For Box Office, please visit www.boxofficeme.com or call +971 4 367 6699. For Time Out, please visit www.timeouttickets.com or call 800 4669. For further information on the Dubai International Racing Carnival, please visit www.dubairacingclub.com. Meydan - The world's racing capital. Meydan Grandstand and Racecourse is the brainchild of His Highness Sheikh Mohammed bin Rashid Al Maktoum, UAE Vice President and Prime Minister and Ruler of Dubai. It is the culmination of his vision to create not just the ultimate venue for horseracing, but also an integrated city that is sustainable, environmentally responsible and also one that positions Dubai at the centre of the competitive global business stage. Meydan City will feature the Meydan Free Zone and four distinct sub-districts - the Meydan Racecourse; where the Meydan Grandstand will take centre stage and be home to the 2010 Dubai World Cup, Meydan Metropolis; a series of state-of-the-art business parks, Meydan Horizons; where business towers intermingle with luxury waterfront developments and Meydan Godolphin Parks; with its distinctive Godolphin Tower created in the image of a thoroughbred and also where the shopping destination Signature Mall is located.